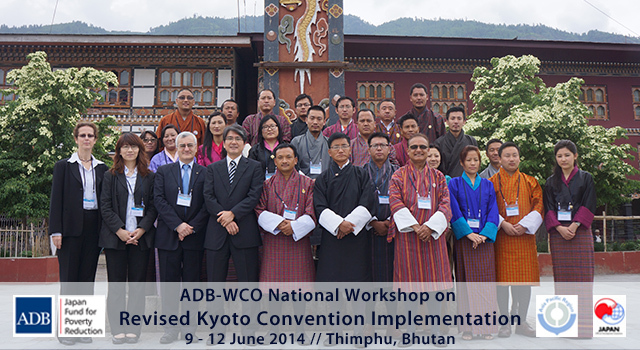 This Asian Development Bank-World Customs Organization (ADB-WCO) National Workshop on Revised Kyoto Convention (RKC) Implementation was held on 9-12 June 2014, in Thimphu, Bhutan in follow-up to the first National Workshop on the RKC, conducted in November 2012. Both workshops were held in conjunction with Bhutan’s Department of Revenue and Customs (DRC) and aimed to support accession to the RKC and the practical implementation of the General and identified Specific Annexes of the RKC. Status update on Bhutan’s accession to RKC, delivered by the DRC: The National Assembly of Bhutan ratified the accession process in January 2014, and the National Council ratified the process on 5 June 2014. Royal Government of Bhutan internal processes will now be finalized and the Instrument of Accession will be submitted to WCO in the latter half of 2014. Discussion and implementation planning on RKC provisions relating to Business Partnership: Mr. Georges Cantone, expert from WCO Headquarters, Brussels, presented and explained the RKC provisions relating to business partnership, and introduced the WCO Guidance Material on Customs and Business Partnership/ Engagement. Ms. Naoko Tanaka, expert from Japan Customs, shared the experience of how Japan fulfilled RKC requirements on business partnership. The Workshop discussed how business partnership could be most effectively implemented in Bhutan, before working in breakout groups to jointly develop a preliminary draft action plan, based on the WCO model, for three elements: (i) Memorandum of Understanding, (ii) Enquiry Point, and (iii) Web Services (for business and the public domain). Discussion and implementation planning on RKC provisions relating to Special Procedures for Authorized Persons: WCO and its Asia Pacific Regional Office for Capacity Building (ROCB A/P) presented and facilitated a discussion on RKC provisions relating to special procedures for authorized persons, detailing the difference between Authorized Persons and Authorized Economic Operator (AEO) programs in the context of the WCO SAFE Framework of Standards. Japan Customs shared the evolution and detailed components of Japan’s Simplified Declaration System, and the more sophisticated AEO Program developed in Japan during 2006-2010. Participants discussed in groups how Bhutan could best develop and implement a compliance program to satisfy the requirements of RKC General Annex 3.32. A Stakeholder Consultation was held by DRC on 12 June to inform members of the private sector and other government agencies about the topics of the workshop (business partnership and authorized persons program, aligned with the RKC) and how they may impact import and export procedures in Bhutan, following accession to the RKC. The Stakeholder Consultation was attended by representatives of the private sector, including forwarders and clearing agents from Phuentsholing; Bhutan Chamber of Commerce and Industry; and government officials from the ministries of Agriculture and Forest, Economic Affairs, and Finance. Preliminary draft Action Plans for Implementation of the Business Partnership Concept and the Authorized Persons Program, which shall be further refined and submitted to the Director of DRC for consideration and approval. Awareness-raising activities on the implementation of successful business partnership and authorized persons programs will be initiated within Bhutan’s private sector and other government agencies, in line with the provisions of the RKC. Ways to engage Bhutan’s National Trade Facilitation committee will be explored to raise awareness and consult with a broad base of stakeholders for coordination and effective implementation of the RKC provisions. Opportunities to conduct internal awareness-raising activities within DRC will be determined, in line with the topics of the Workshop. ADB, in cooperation with WCO ROCB A/P, will continue to support DRC and the Government of Bhutan in trade facilitation activities. Mr. Yonten Namgyel, Director, Department of Revenue and Customs (DRC), Ministry of Finance of Bhutan opened the workshop, assisted by Mr. Yoshihiro Kosaka, Head, ROCB A/P, and Ms. Rose McKenzie, Regional Cooperation Specialist, South Asia Regional Department, ADB. In his opening remarks, Mr. Namgyel, DRC Director, reminded participants that although the formalities of Bhutan’s accession to the RKC were almost complete, the main task of RKC implementation lies ahead and will demand much focused work. The Workshop was attended by DRC officials responsible for development of procedures, rule-making, establishment of administrative structures, and capacity building, from headquarters in Thimphu, as well as regional offices in Gelephu, Paro, and Phuentsholing. Resource persons from WCO, Japan Customs, and Japan International Cooperation Agency participated, together with ADB staff and national trade facilitation experts. The Asian Development Bank and the World Customs Organization Asia Pacific Regional Office for Capacity Building jointly organized the Workshop, which was funded through a Japan Fund for Poverty Reduction national technical assistance project.